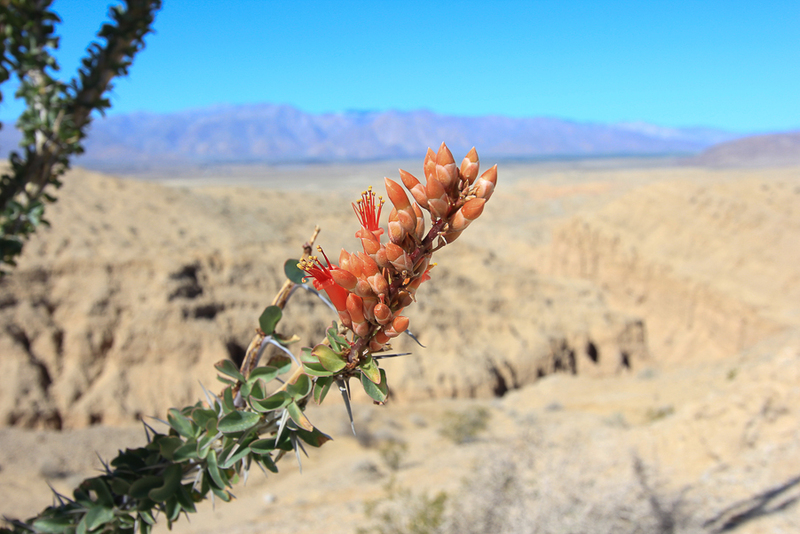 March 8, 2016 - Today we went back to the Anza-Borrego Desert State Park in pursuit of wildflowers. 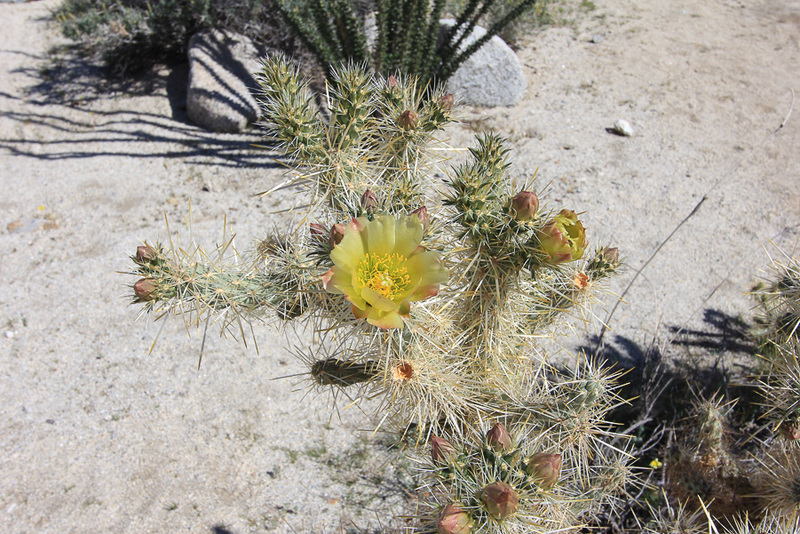 Late winter is when they generally bloom and the park did receive a little bit of rain yesterday. 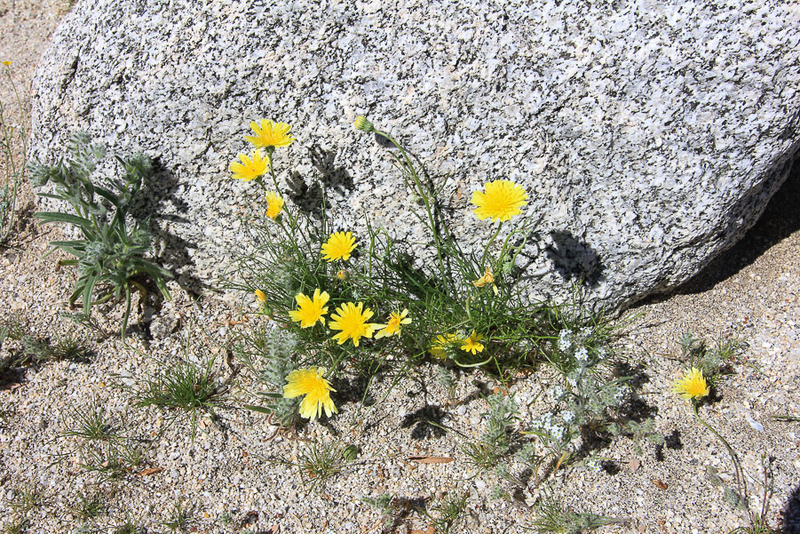 ABDSP is the largest state park in California with about 600,000 acres. 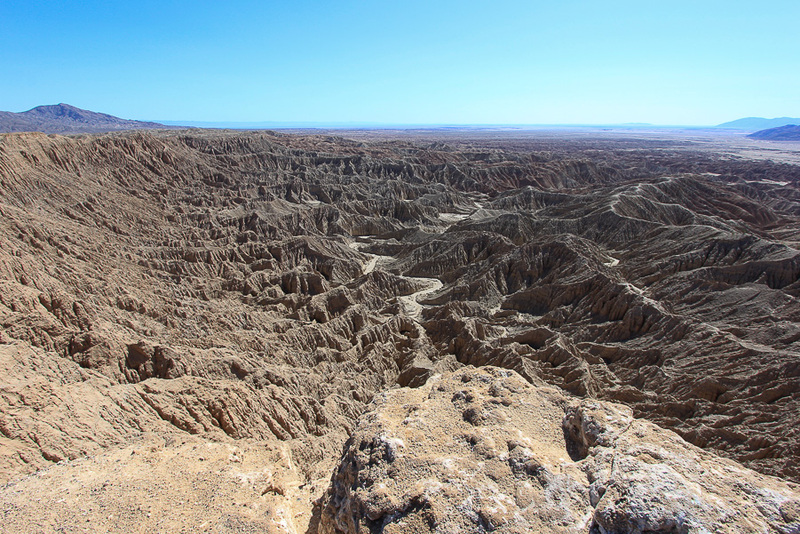 The park takes its name from 18th century Spanish explorer Juan Bautista de Anza and "borrego," the Spanish word for bighorn sheep. 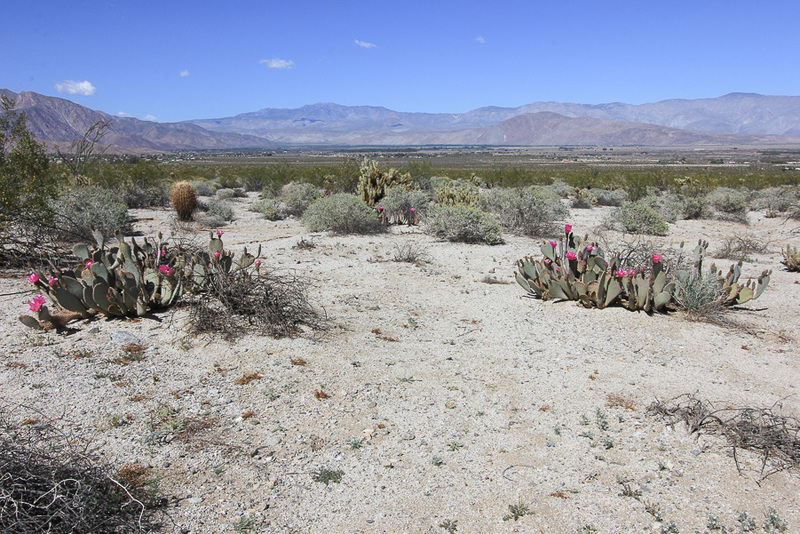 However, visitors rarely see any of the desert bighorn sheep since there are only about 600 of them in residence here. 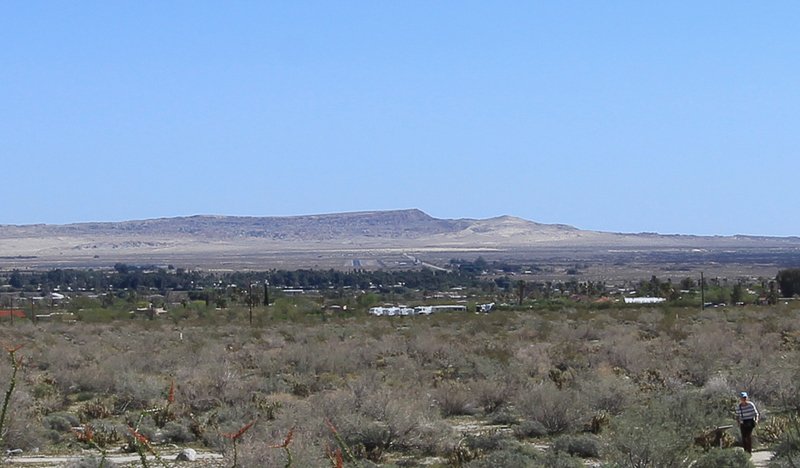 We drove in from the Salton Sea which gave us the opportunity to explore Font's Point. 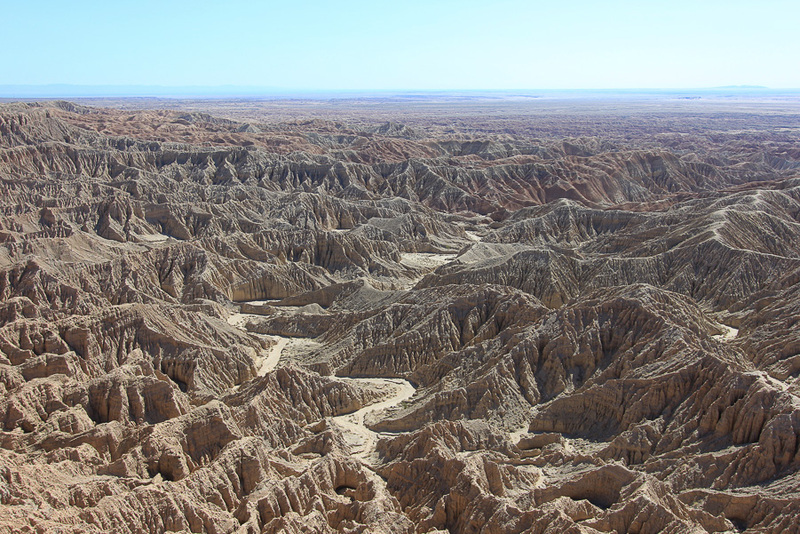 The point, shown in the center of the picture below, overlooks the Borrego Badlands, formed by long term erosion by wind and water. 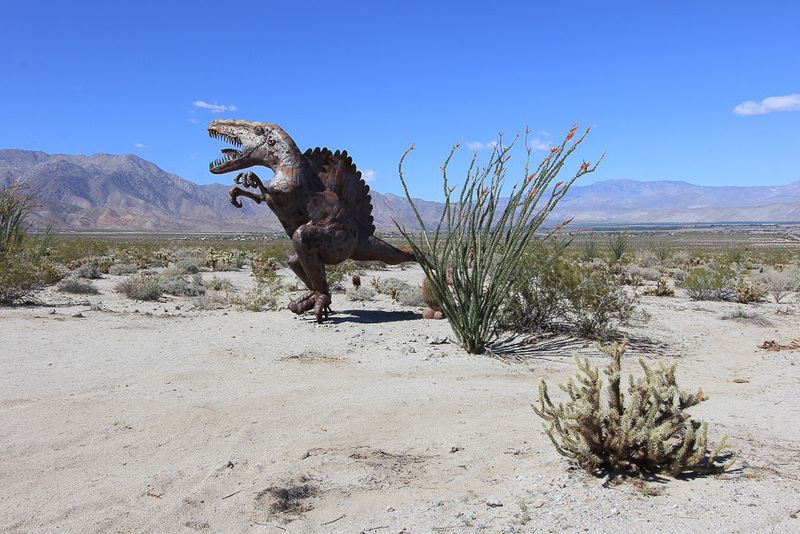 Getting to the "Point' in our new CR-V was great because we held out for the "all wheel drive" version. 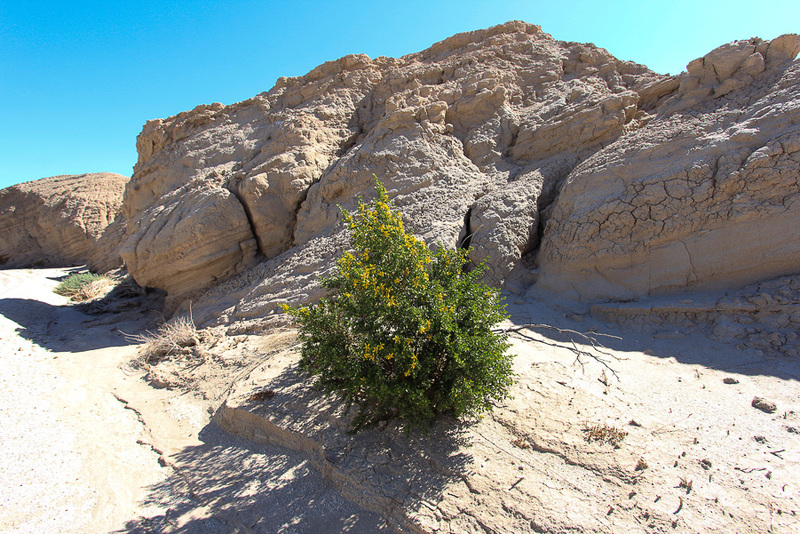 The trek to the point was over nine miles of dirt and sand roads. 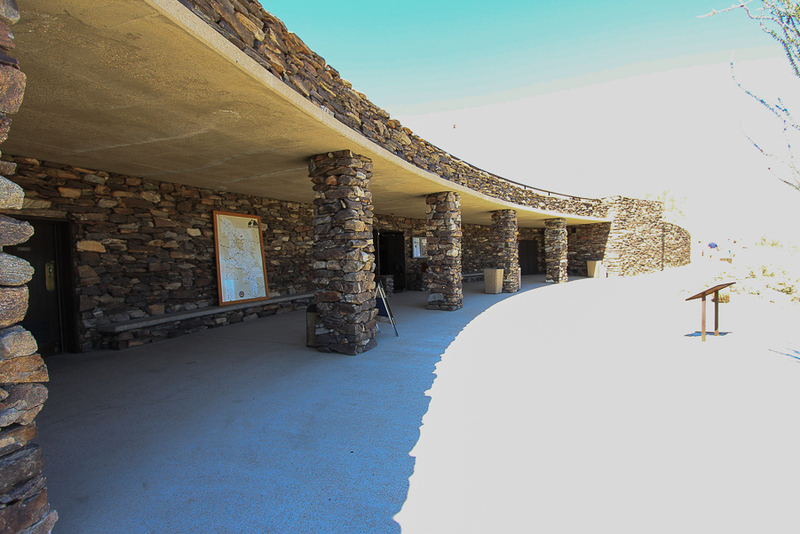 Our next stop was at the subterranean Visitors' Center that was built below ground for natural cooling. 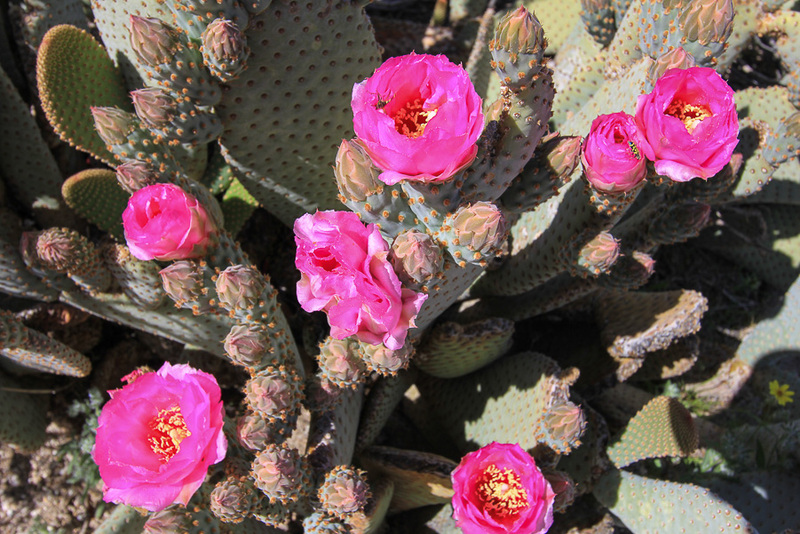 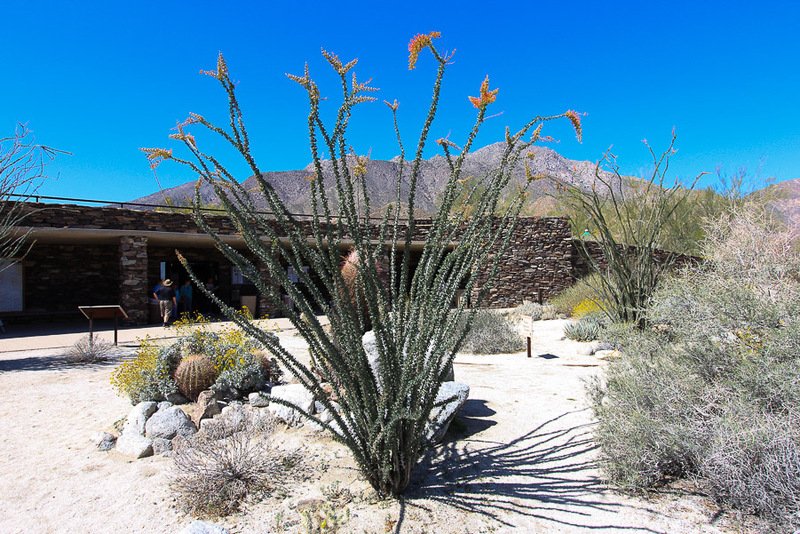 The Visitors' Center was surrounded by blooming desert plants. 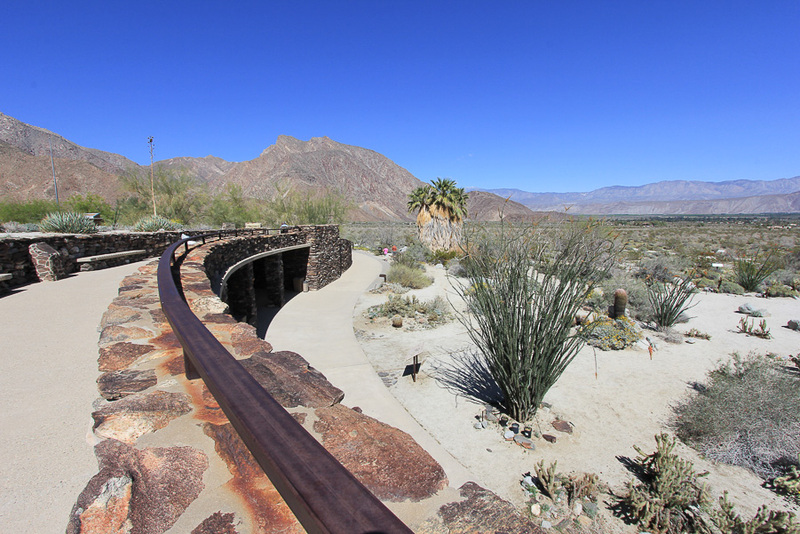 We looked around here and then headed out into the park to check out some of the recommendations made by the park staff. 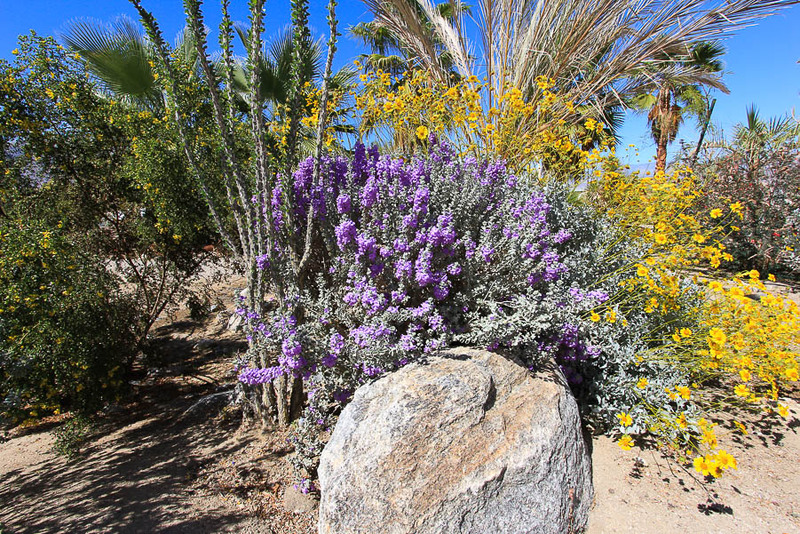 Some of the plants shown below are identified to the best of our ability. 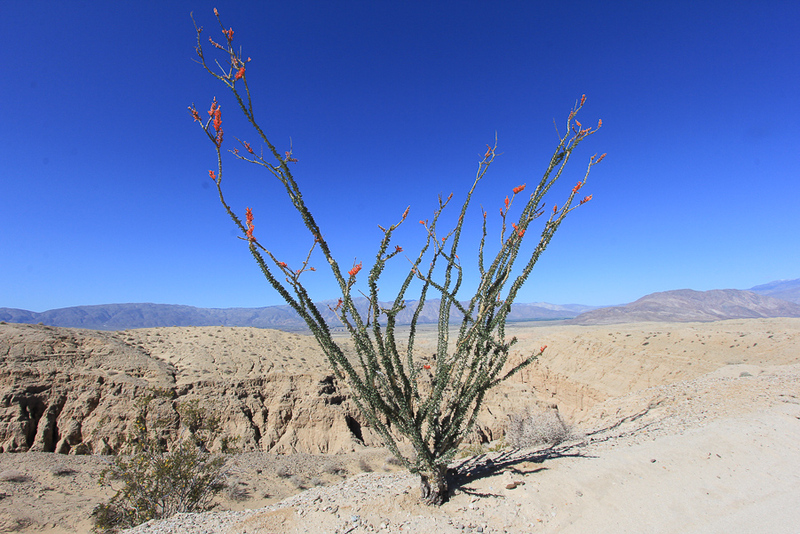 The first one shown is the ocotillo. 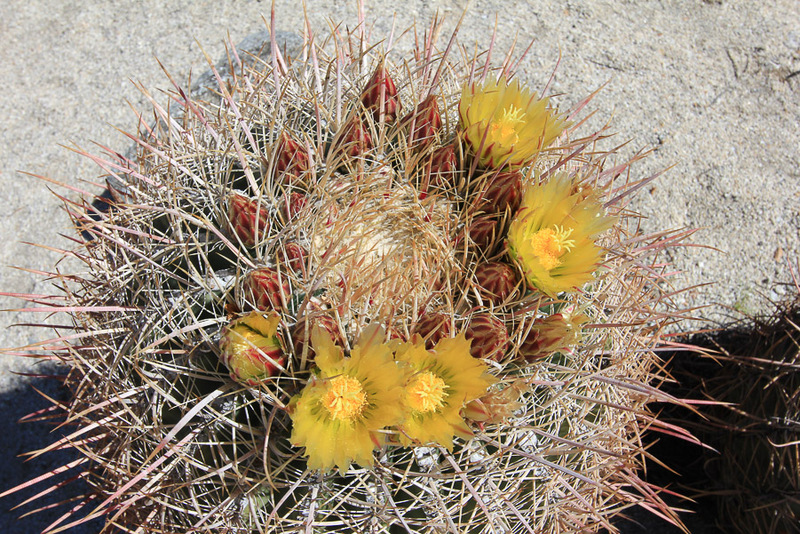 This is a desert barrel cactus. 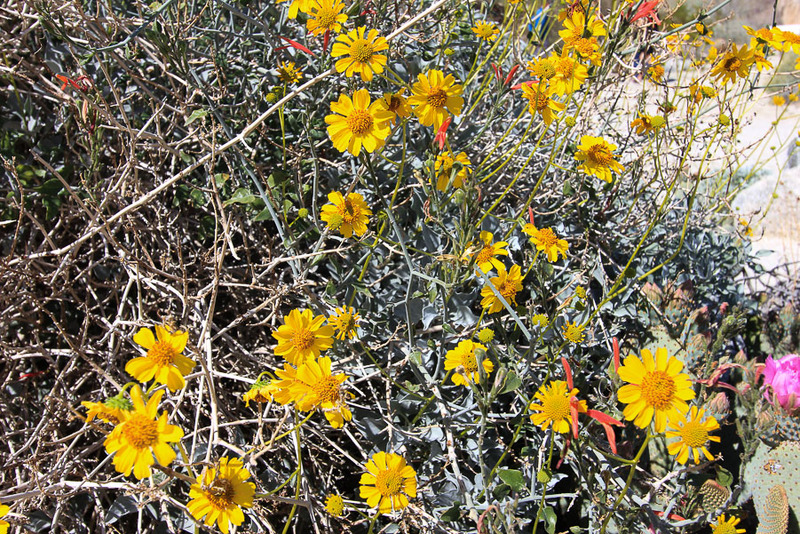 This is probably a desert dandelion. 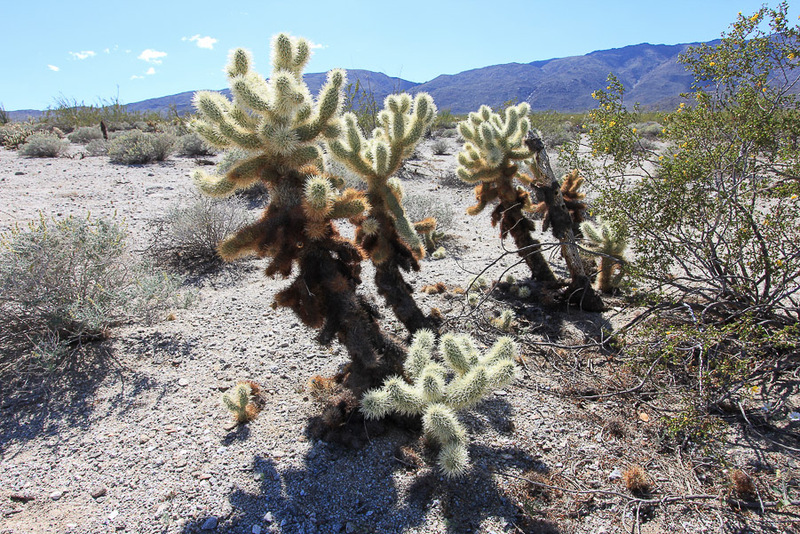 This is a Teddybear Cholla cactus. 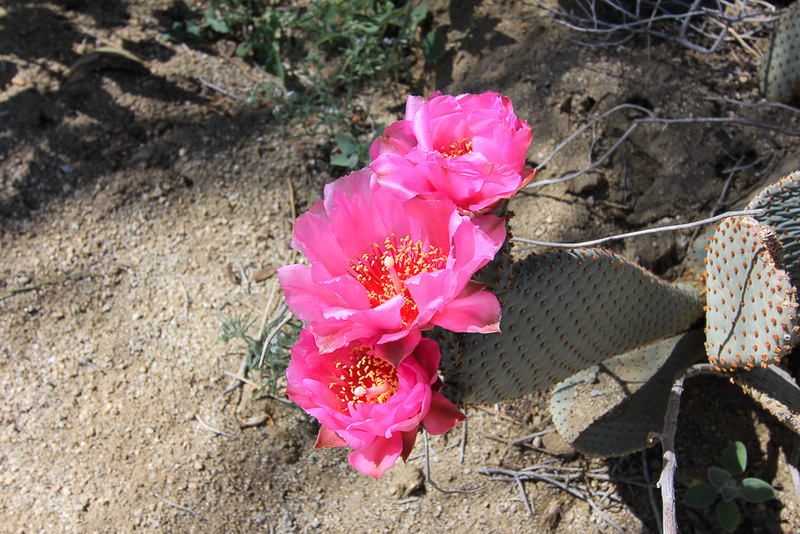 This is a Beavertail Cactus. 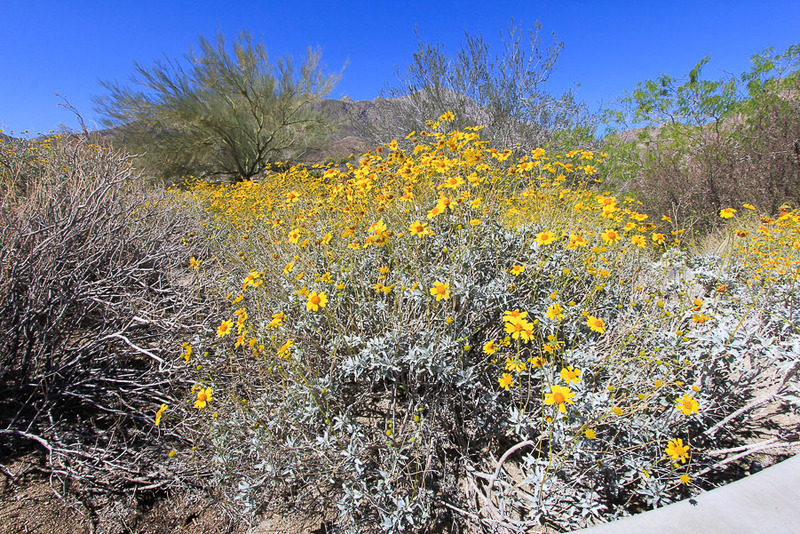 This is probably a desert sunflower. 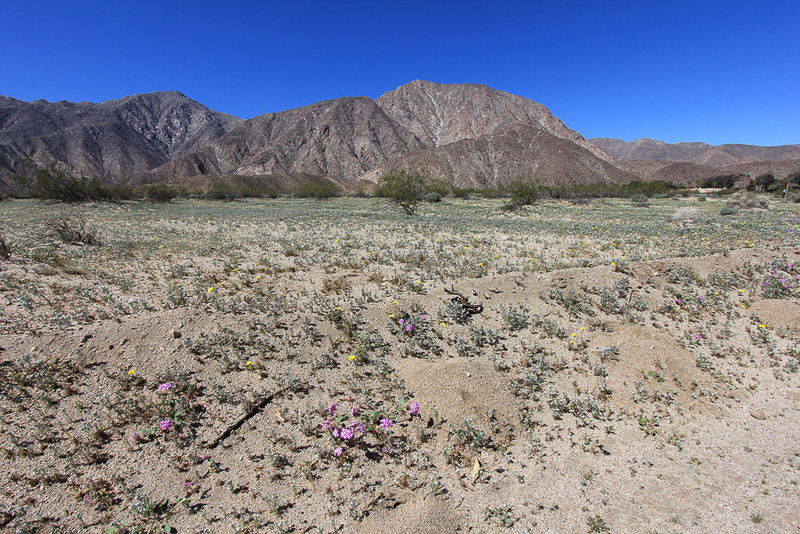 This large field was sparsely covered in wildflowers, due to the drought. 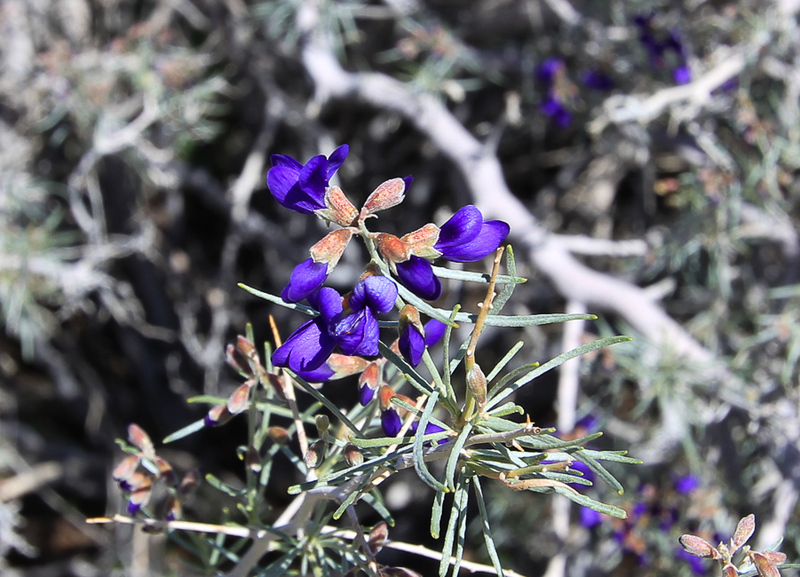 This is probably an indigo bush. 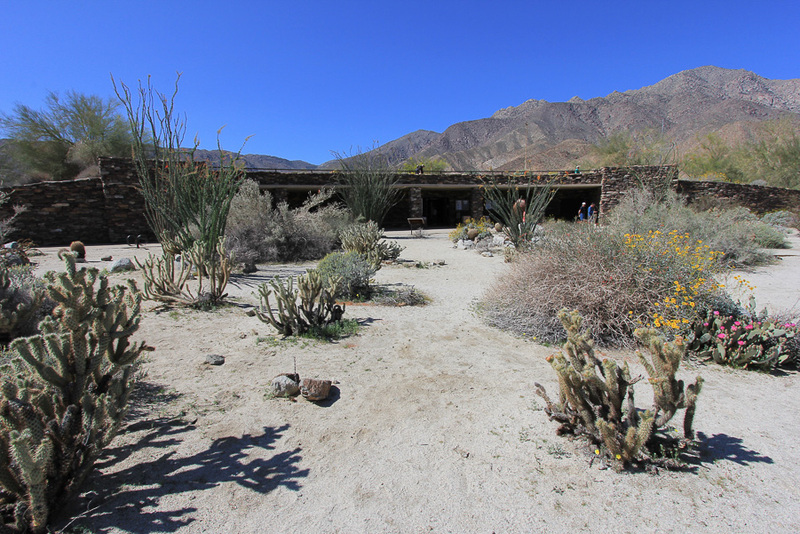 We stopped for lunch at Carlee's Place, right off of Christmas Circle in downtown Borrego Springs. 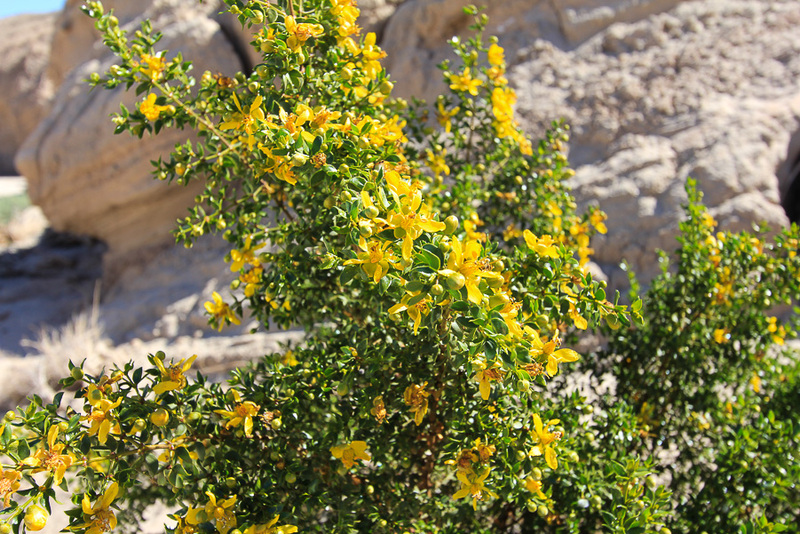 It wasn't fancy, but it was good. 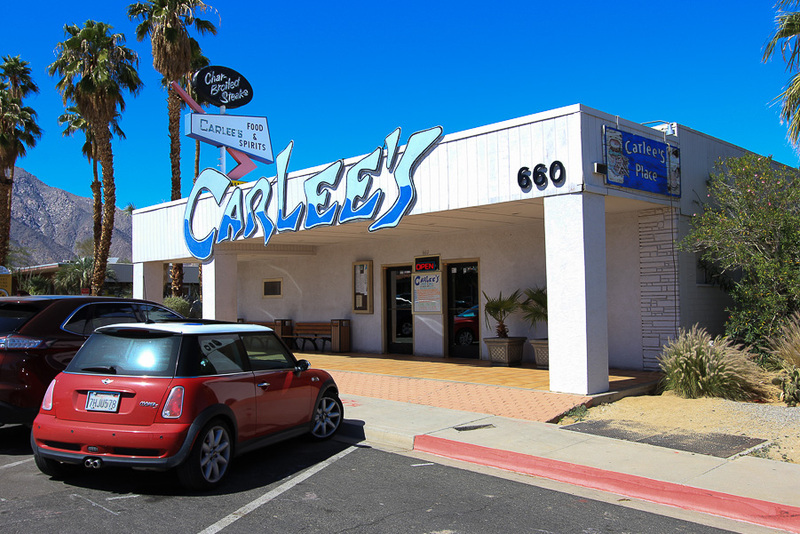 A hamburger for Judy and a grilled ham and cheese for me. 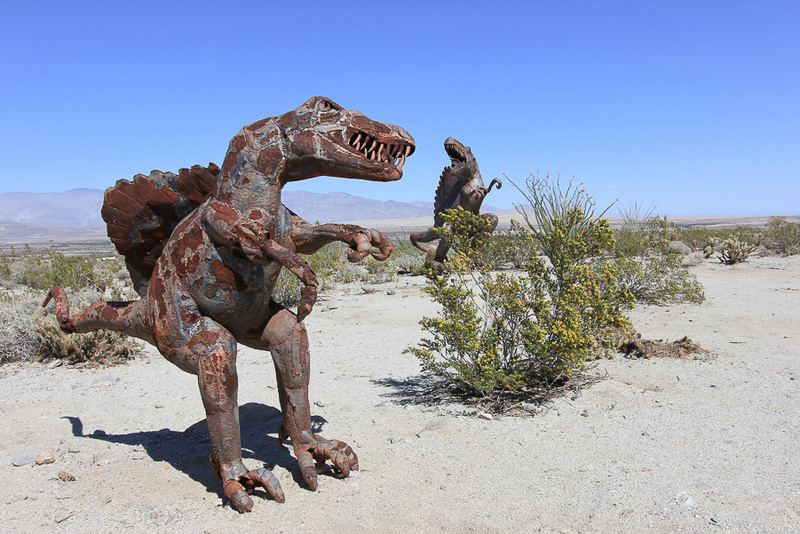 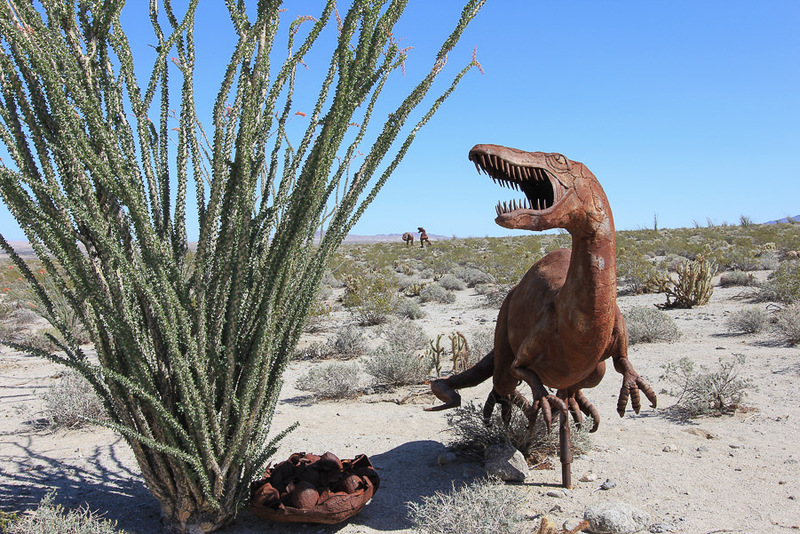 The late Dennis Avery, land owner of Galleta Meadows Estates in Borrego Springs envisioned the idea of adding "free standing art" to his property with original steel welded sculptures created by "Perris, CA Jurassic Park" owner/artist/welder Ricardo Breceda. 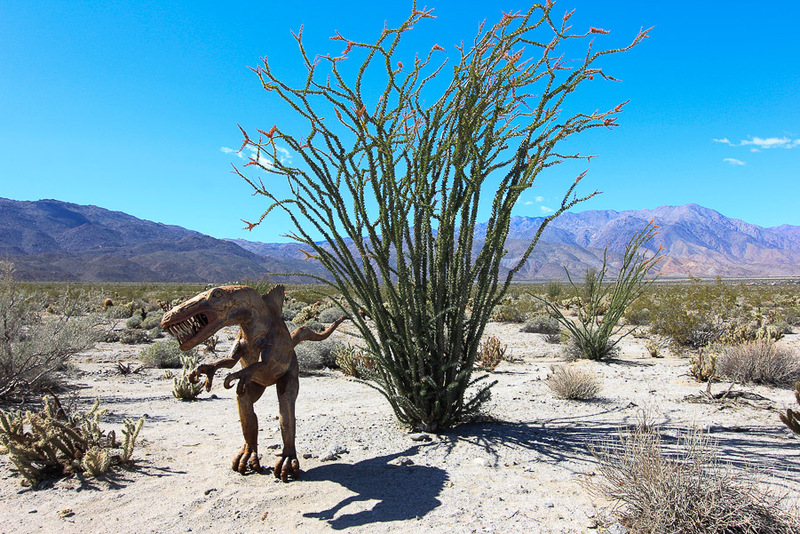 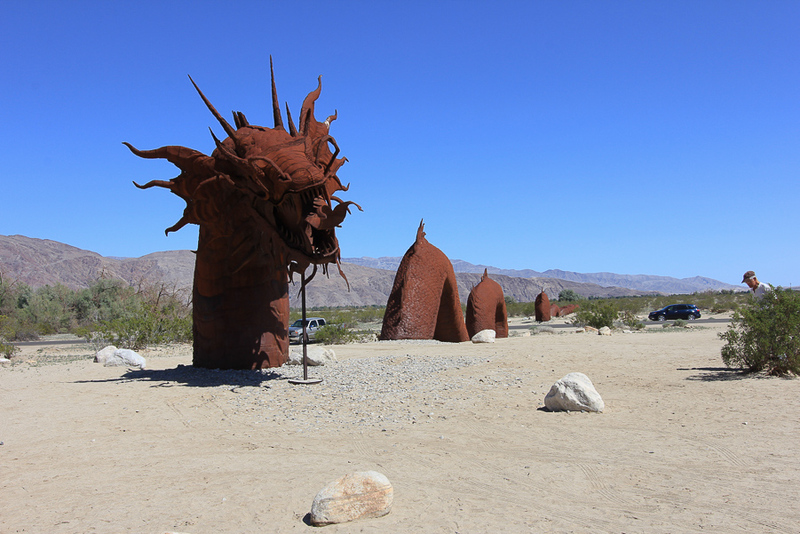 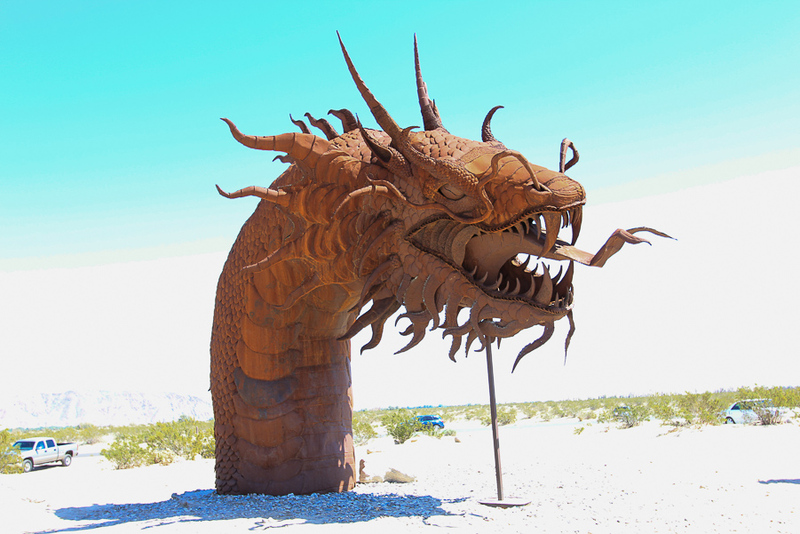 There are over 130 metal sculptures located in Borrego Springs, all due to Avery's vision of the desert. 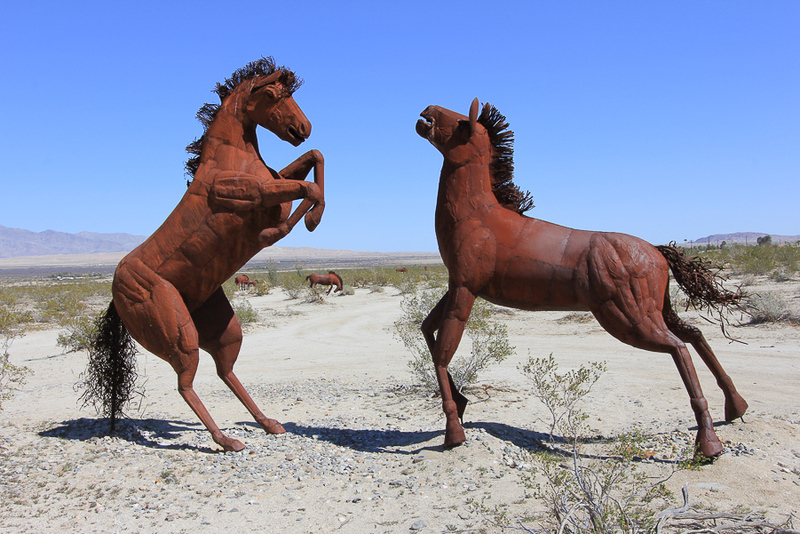 It is a delight to see these sculptures in this setting. 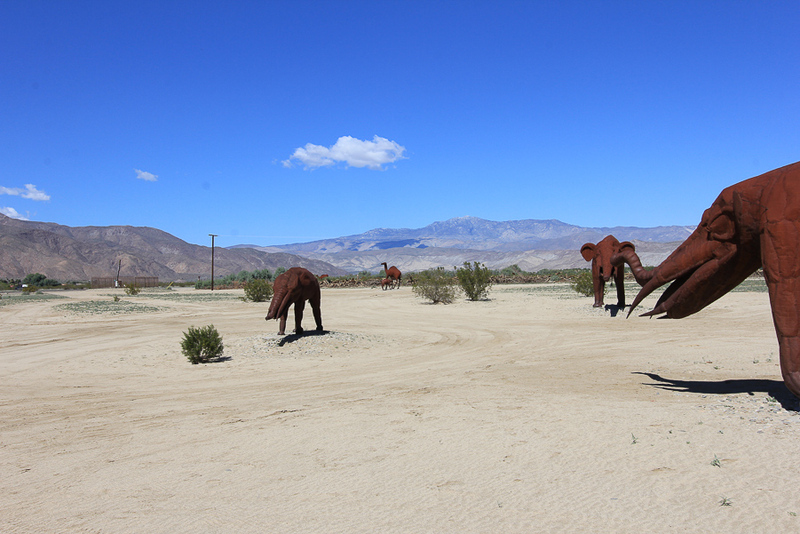 It was a long, full day but we enjoyed it all.